Beatles John, Paul, George, and Ringo will forever be known as the Fab Four. But did you know there was a fifth Beatle? 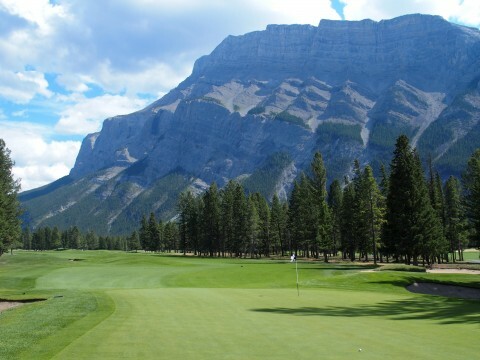 In the Canadian Rockies of western Alberta, there are five golf courses whose mountain backdrops are so spectacular, they’re guaranteed to rock your world. 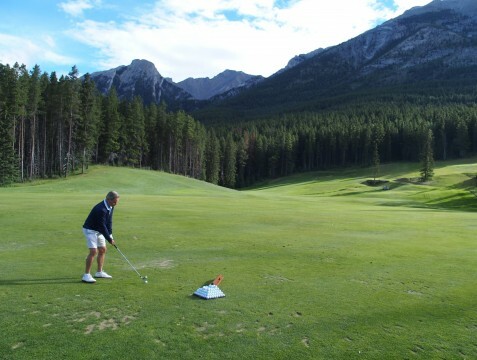 Drive 30 minutes southwest to Banff from Canmore and you’ll thrill to the Fairmont Banff Springs Golf Course. 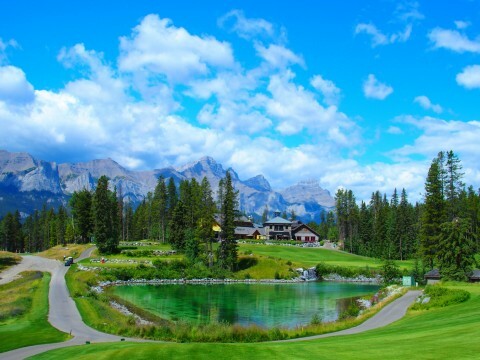 This Stanley Thompson-designed masterpiece is hosted by a nine-story hotel that is known around the world as “Canada’s Castle in the Rockies.” The fifth jewel in the Canadian Rockies golfing crown entices you to travel four hours north from Banff. 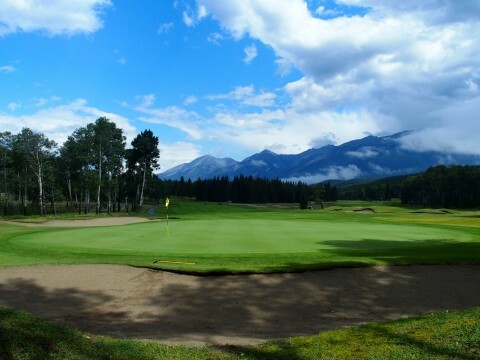 Fairmont Jasper Park Lodge Golf Club holds the title as “Canada’s Number One Resort Course.” Here is your “Ticket to Ride” for discovering why these courses are The Fab Five of Canadian Rockies golf. 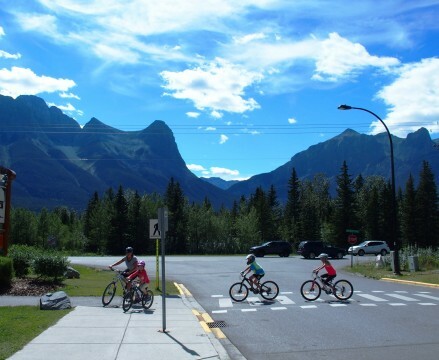 The Town of Canmore is small but vibrant with restaurants, music festivals, breweries, shops and a stunning public access community center called Elevation Place where several Olympic athletes are known to train but is also frequented by many town residents and visitors. Inside the eclectic $40 million complex is everything from a library, pools and world-class rock climbing walls to a fitness center, children’s area and a food and beverage bar. Speaking of food in Canmore, several establishments are worth visiting. The Iron Goat Pub & Grill offers mountain views as spectacular as the food. Tavern 1883 has indoor and outdoor seating – as do most of the Canmore resturants (the better to embrace the fresh mountain air and unforgettable vistas – and many tasty choices including a funky appetizer called Duck Nuts that are scrumptious. Grizzly Paw Pub & Brewing Company has so many great brews that it’s hard to settle on one. 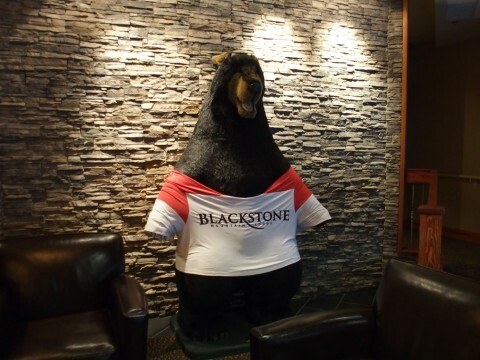 Capping a day of Canmore, golf, food, and fun will occur with an exclamation point if you stay at either the Blackstone Mountain Lodge and StoneRidge Mountain Resort. These upscale properties are finely appointed and in great demand. Make sure you book early. They are owned and operated by Clique Hotels & Resorts, which also features a convenient, trendy and well-regarded hotel near the Calgary International Airport. 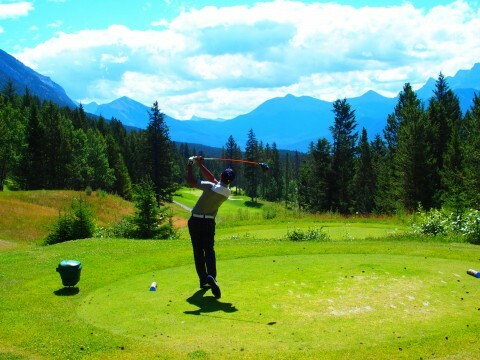 Silvertip Golf Course, with elevations as high as 4,400-feet, is often described as feeling like “golfing on top of the world.” Before you even tee off, the Silvertip driving range is one you’ll never forget. Golfers hit their practice shots into the face of Mount Lady MacDonald. Topping out at over 8,000-feet, Lady MacDonald leans out so far, not even your highest drive will near its peak. You’ll enjoy listening for accents among the Silvertip staff. More than a dozen members of the Silvertip team hail from Australia. 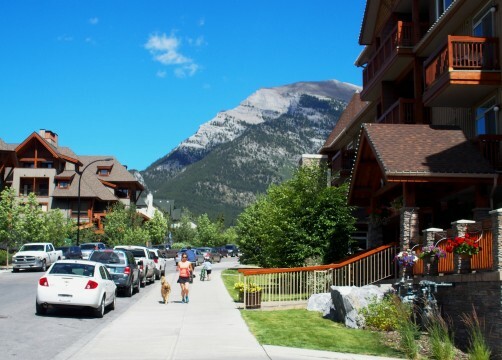 Many of the Aussies are drawn to Canmore’s world-class mountain climbing, hiking, and skiing opportunities. 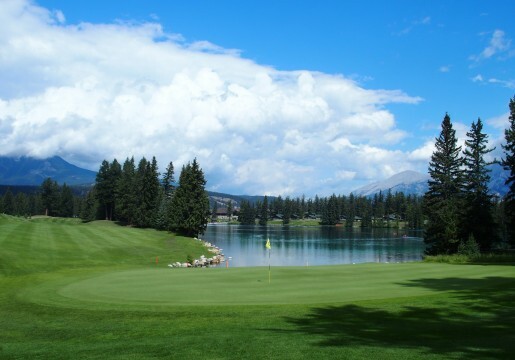 It’s hard to resist not falling in love with Silvertip’s 18th hole. You’ll need to duck to keep from brushing your golf cap on the clouds just above the elevated tee box. Once you reach the green, keep on walking to the outdoor deck at Stoney’s Bar & Grill. All Rocky Mountain golf courses pride themselves in offering outdoor dining and imbibing options with views that are to die for. Stoney’s features an awesome view of the 18th green. The emerald green lake next to the putting green is blindingly brilliant on a sunny day. 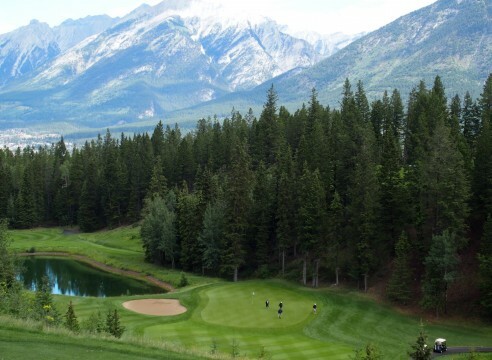 Stewart Creek is one of Alberta’s most luxurious golf properties and a winner of numerous Best in Golf awards. 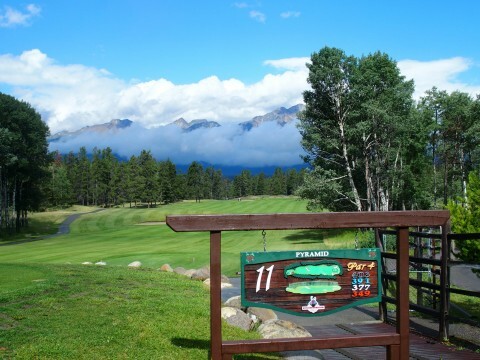 If you’re a mountain lover, at Stewart Creek you’ll witness no fewer than four mountain ranges over 18 holes. Your head will swivel at the Cascade, Pigeon, and Three Sisters mountains, as well as Ha Ling Peak. 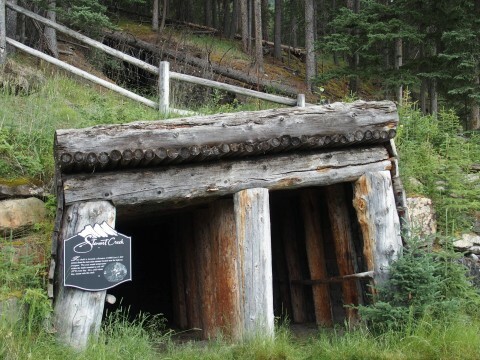 History buffs will buzz over the fact that Stewart Creek is built on what was formerly an abandoned coal mining site. The course architect kept two historical remnants of these mine shafts visible on the front and back nine. Before or after your round, it’s hard not to appreciate the visuals and ambiance of the Stewart Creek clubhouse. This two-tiered facility’s glass wall exterior features high-def views of the 18th hole and the Rundel Mountain Range. Inside the clubhouse you’ll rub elbows with members and vacationers who’ve played golf around the world. The Stewart Creek vibe is one of an international flavor with fellow players exuding a real appreciation for the game of golf. At Stewart Creek you’ll be reminded how small the world has gotten and the intercontinental pull of golf. Several of the Stewart Creek staffers arrived in Canmore to take advantage of the plethora of mountain sport opportunities. You’ll hear multiple mentions of Canmore’s Nordic Center where athletes can take part in biathlon training. Spend a couple of days in Canmore, and you’ll observe that this town of 12,000 people may be one of the fittest cities in the world. Rocky Mountain golf makes a point of immediately drawing you in. 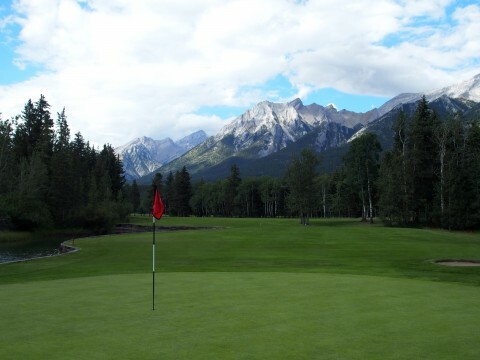 On the first hole at Canmore Golf & Curling Club, you’re advised to hit your drive toward the crevasse separating the Rundel and Cascade Mountains. Is there another course in the universe where your target points at not one, but two mountain ranges? There is something to be said for researching the nuances of your vacation destination. 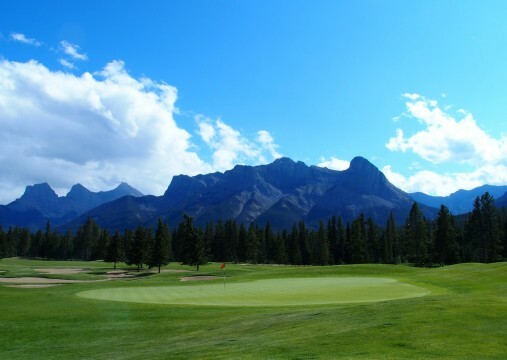 At the Canmore Golf & Curling Club, you’ll discover Canmore is located smack dab in the middle of the Edmonton Oilers and Calgary Flames hockey rivalry. It may be wise to ask your playing partner which side of this intense rivalry he or she leans before spewing your own take on who should rule in the coming season. 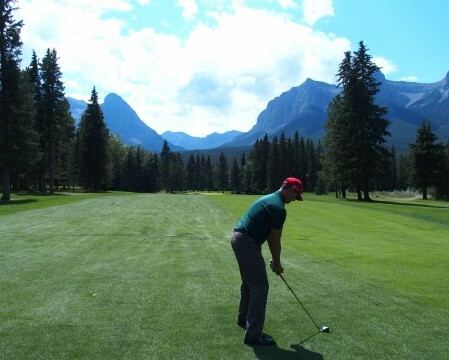 Considering the spectacular views and conditions, Canmore Golf and Curling Club’s modest greens fees may be the Canadian Rockies best golf value. 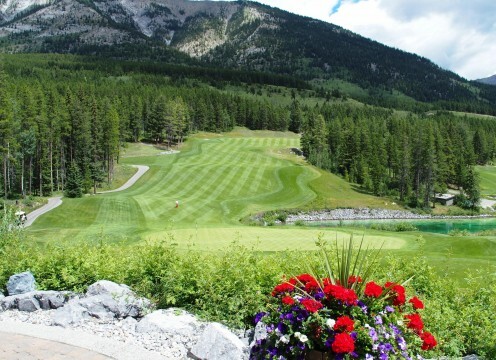 Fairmont Jasper Park treats golfers like rock stars. On the first tee, the starter announces each player’s name and hometown. You’ll note that on each tee box, every golf hole has a name that honors a chapter in Jasper history, geography, or a famous individual. The most storied moniker is on the 9th hole, a long par three. The name Cleopatra is based on the way course designer Stanley Thompson configured the mounds surrounding the putting green to match his minds-eye image of the Egyptian Queen. Over the years, movie stars and British royalty have trekked to Jasper to see if the spectacular surroundings were indeed as beautiful as the hype. Crooner Bing Crosby stayed long enough, in 1947, to win the Jasper Park Golf Club’s Totem Pole Tournament. 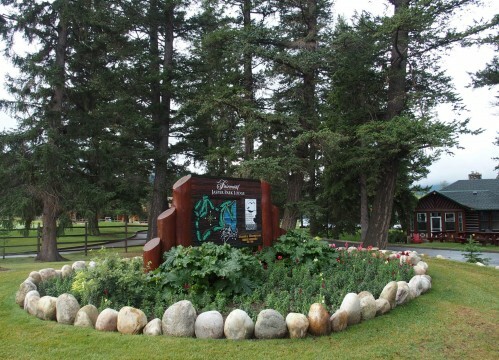 Fairmont Jasper Park Lodge Golf Club recently celebrated its 90th anniversary. Today it takes four hours to drive to Jasper from Banff. When the course opened in 1925, it took 30 days to travel on horseback. 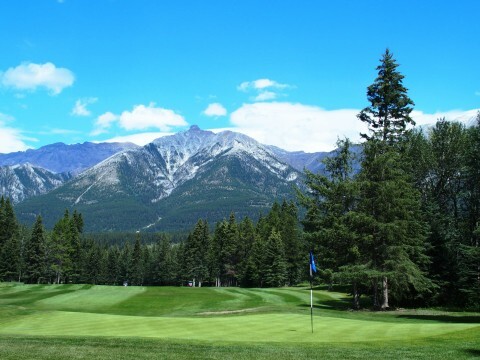 Golfers choose Jasper Park Lodge Golf Club to not only be surrounded by its mountain range, but also to inhabit an environment where animal life thrives. It’s not uncommon to awaken to find elk grazing right outside your cabin. To say that animals thrive in these surroundings is an understatement. The antlers of the elk living in Jasper National Park are said to grow 2 ½ centimeters per day. Four million visitors choose Banff as a vacation destination every year. 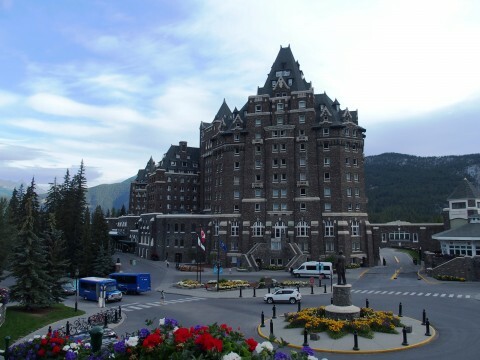 The nine-story Fairmont Banff Springs Castle in the Rockies is one of the city’s main drawing cards. 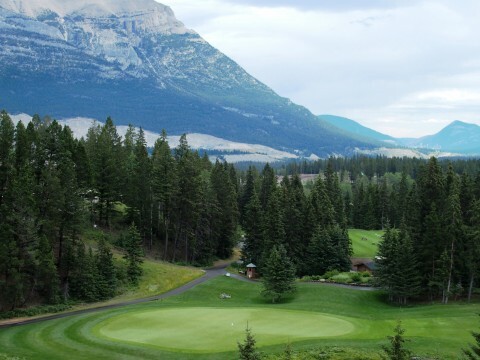 The 6,900-yard Banff Springs Golf Course is surrounded by Sulphur Mountain and Mount Rundle. The mountain ranges are visible everywhere you look on this Stanley Thompson design. 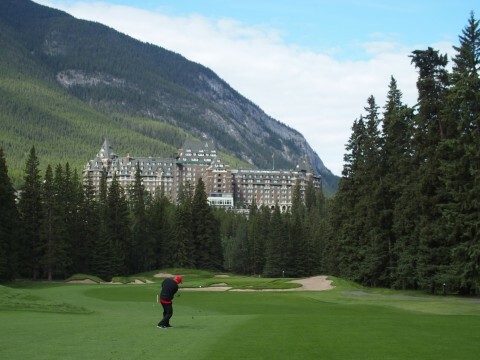 The number of signature holes at Banff Springs are too numerous to count. One hole that is particularly impressive is the Par 4, 440-yard 14th hole. This hole is the ultimate photo opportunity. As you approach the 14th green, the Fairmont Banff Springs Hotel juts out from the woods and serves as a striking backdrop. Elk appear on the golf course almost daily around sunset. 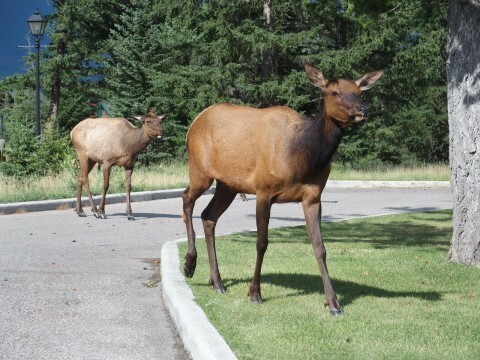 A few years ago, a famous elk confrontation occurred on the 16th hole when two bull elks started fighting. Scenes from the 1954 movie “River of No Return,” starring Marilyn Monroe and Robert Mitchum, were shot on the golf course grounds. A photograph of Monroe awkwardly holding a golf club can be seen in the Banff Springs hotel. 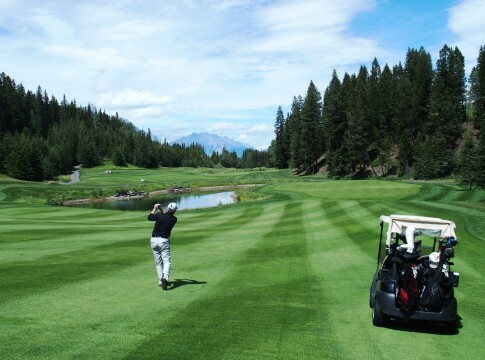 Whether you play one or play all of the Canadian Rockies top five golf courses, each venue promises a golf rush. This is extreme golf with a premium placed on magnificent mountain views in a setting that is so quiet you’ll feel obliged to look skyward before speaking. 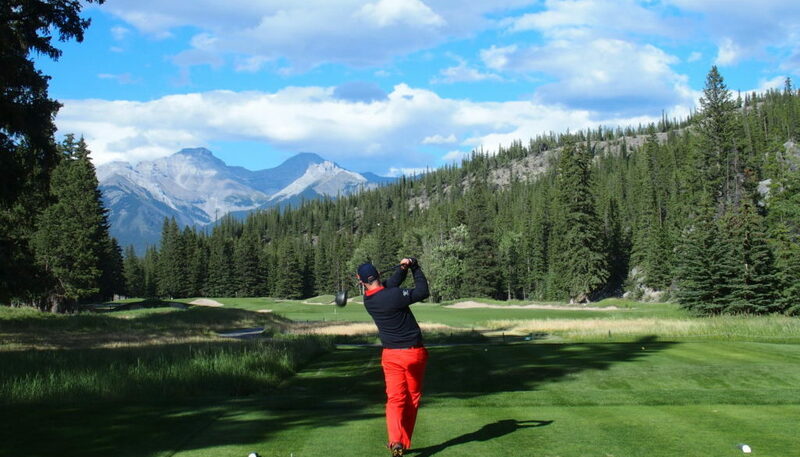 If God plays golf, the Canadian Rockies is where he’d book his first tee time. Tim Cotroneo is a Minneapolis-based freelance writer specializing in travel, business, and golf.